I've been in the UK this week, and I'm trying a new approach to save money on phone calls during my travels. I recently purchased a Skype-certified USB handset called the "Free-1" from IPEVO, and decided to try Skype instead of my usual (costly) method of making calls back home using my mobile phone or my calling card. It comes in black and white color choices, and I chose black so it doesn't end up looking as scuffed from being tossed into my laptop bag. I'm quite pleased with the results. The IPEVO handset is very small and easy to pack in my laptop bag, and it's a snap to use (plug it into your USB port, tell Skype to use it as its default audio device, and you're done). 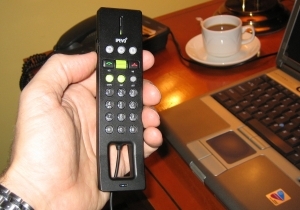 Once it's connected, it operates much like a normal phone, and integrates directly with the functionality of Skype, making it easy to browse your address book and dial calls manually. For the calls back home, I didn't want to be constrained by only being able to communicate with other people using Skype, so I purchased 10 Euros worth of "SkypeOut" minutes (about $12.50 US). This allows me to call phone numbers anywhere in the world for about 2 cents per minute using any broadband connection. When I purchased my credits, I paid by PayPal and received a special block of 120 bonus minutes (eBay owns both Skype and PayPal), giving me about 8 hours of calling time for that same $12.50 - what a deal! SkypeOut, coupled with the IPEVO handset, makes the experience a simple one - I simply press the "OUT" button on the handset (a green plus sign), then dial the number I want to call. I then press the green handset button to make the call and my call is dialed. When the call is complete, I press the red handset button to end the call. Skype keeps a running tab of my remaining SkypeOut credits so I don't have to guess. Oh - and the call quality? It is excellent. My wife and some of my colleagues couldn't tell any difference between these calls and the calls I used to make via "normal" phone lines (in fact they found them to be clearer than calls made from my mobile phone). While my interest in this began with a travel-centric view, I will likely end up buying another SkypeOut handset for my home and begin using it for international calling from home, as well. By the way - IPEVO has recently released a handset driver for the Mac, so it's now certified for both Mac and Windows systems.